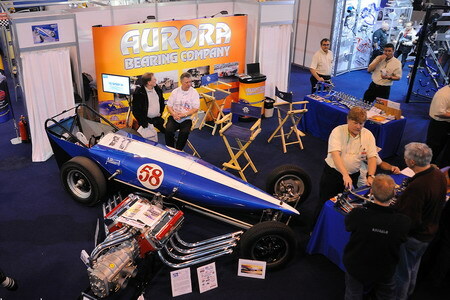 Well, sometimes I thought it would never happen, but thanks to the last minute efforts by Booth-Arons, SBS Worldwide, U S Automotive, Aurora Bearing Company, Andy Robinson, Bob Roberts, Doug Hill’s team at the museum and Chris Eames we finally had the car and engine ready for Autosport International. Phew! Thursday January 13th was the first day of the show, which was only open to the industry. ACAG staff included Stuart Bradbury, Bob Roberts and myself. Everything was set up and ready for the 11:45 am reveal to the attendees and press of our Booth-Arons re-created 354 Chrysler Hemi engine. Alan Allard and son Lloyd were well in time and the reveal went quite smoothly. There was lots of interest and pics with a video made by Performance Direct who also supplied a bit of glamour to the proceedings. Stuart had the 1964 Drag Festival starter’s jacket and flags to add a bit more nostalgia. Saturday and Sunday were open to the public and fortunately we had some more support from the ACAG team. Again we were helped out by the F&A team now including driver Chris Andrews. Just as well because it became very busy. Also met Mark Old of RBS Insurance – another of our new backers. We had a couple of interesting visitors. Jim Tiller stopped by - he drove the Allard Chrysler back in 1962/63 so we had to get him to sit in the car again. I mentioned to him that he might like to attend the Dragstalgia event at Santa Pod in July! 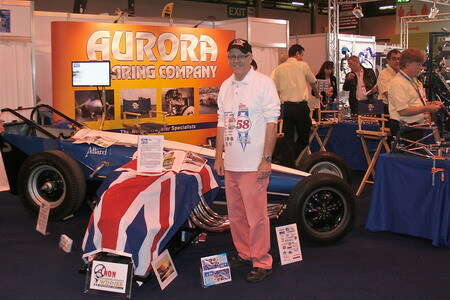 And Land Speed Record breaker Richard Noble stopped for a chat. I’m afraid I could not answer some of his questions. Far too technical for this secondary modern school lad. The show ended at 6:00 on Sunday and it was good fun to meet up with a few of my old industry contacts as well as the drag racing fraternity. And it was great to show the car with an engine for the first time. They can both be seen at the National Motor Museum, Beaulieu now. We picked up a few new sponsorship enquiries to follow up and there will be plenty of publicity because we created quite a stir. I think we have reached a higher level of credibility now we have the engine. All those who have helped by purchasing ACAG branded items, providing sponsorship or giving donations, can see that their money has actually bought something special. And potential sponsors can see that we are serious by what we have achieved so far without major sponsorship. Job well done I think. Nowback to the grindstone. Raising new funds and preparing the rolling chassis mechanics to receive the engine. If someone gave me a cheque for £20,000 it could probably be ready in two months. Now who owns Chrysler these days? Ah – Fiat Group isn’t it? I wonder whether they know about Sydney Allard and drag racing in Turin? I wonder whether they know about the Chrysler heritage of which they are now guardians? Our project would appear to be just the job for helping them appeal to motoring enthusiasts across Europe and throughout the USA. 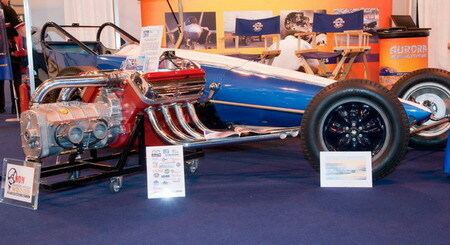 Europe’s first dragster. The prestigious and much respected classic European sports car manufacturer Sydney Allard aligned with the Chrysler name that has provided the blueprint for today’s Top Fuel Dragster and Funny Car power units, and has been the backbone of the sport since the early 1960s. Surely they should be interested - shouldn’t they?